Data. You're surrounded by the stuff. It's everywhere and your life is ruled by machines that take data and do weird things to it, to make weird conclusions. Like the time YouTube suggested I subscribe to videos of Nigel Farage. Yeah... Thanks for that. Data is just a raw stream of characters, symbols or numbers. But we don't think of data like that. Generally we see data as a piece of text, a date, a quantity of something, for example. So, the best thing to do is to organise all that data by what type it is. It didn't matter whether we were using text or numbers or whatever, the technique in pseudo code is the same - just whack a name down and assign a value to it. But this will no longer do, Watson. Computers like it when you tell them what kind of data they are dealing with. In fact, if you don't, most programming languages will vomit out error messages all over the place or simply won't even compile your code. When you've looked at the table below I'd suggest you scroll down to the section on "casting" which explains exactly why you need to care about data types in the exam. Pseudo (pronounced "sue-dough" if you were wondering). What an awesome word, meaning "almost," or "something that is an imitation." Which, really, sounds quite pointless, doesn't it? So why do we bother with it? It really helps you to learn how to program as it's more structured than writing out algorithms in plain English. Oh and above all else - it's the basis for your entire Unit 2 exam! 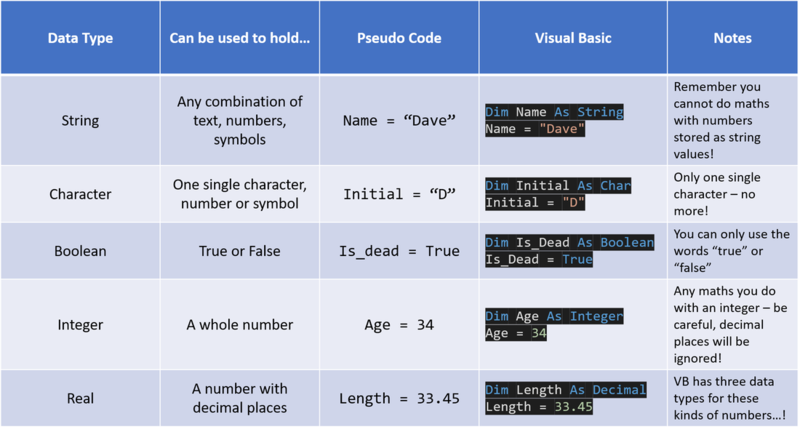 You will be using the pseudo code structure that OCR specify and I'll have given you a copy of, but if you can't find it then you can always download a copy by clicking this link. I Googled "constant" and this came up. 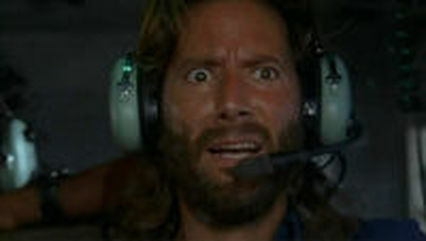 The original caption was "Des, panicking in a helicopter." I needed to search no more at that point. Definition: A variable is an area of memory, which has an associated name, used to store program data. The name variable is a big give away as to how they behave - their contents can vary. This is what makes them useful. It makes life a LOT easier when we give data a NAME that we understand. If you were sat in Maths and your teacher gave you the question "If x=5, what is 2x?" you would instantly say 10. Algebra is the exact same concept as variables - we are storing values and giving them a label, such as x! Variables are even better than algebra because instead of using single letters like x, t, y, n etc we can actually use descriptive names. So, for example, instead of x we could have "number_of_penguins" which is far more obvious, right? Imagine, then, a variable as just a big old box with a name on the side. You can call them anything, but no spaces are allowed. For example, trousers, fish_brackets and custardDigger are all valid names. "Chunder Jacket" would not - because it has a space. You can store more than just numbers in a variable - Text, true or false and so on. You put something IN a variable using the = sign (meaning assign - you 'assign' a value to a variable.) For example, cheese = "brie"
If you were making a program that used these values, you'd be tempted to just use the numbers - why not? They never change so what's the point in giving them a name, let alone going to the hassle of creating a variable for them? Now that's clear, how do we declare these variables? Just like any other, right? Now this value can be used anywhere in your code but you know it won't change. You also know you'll never accidentally use the wrong amount. This is like your toolkit. You don't need much to make really useful programs and we are going to look at only four concepts and, trust me, by combining these you can make any program. The worst thing you can do when writing an algorithm is just sit there and write nothing. Considering you only have a choice of four different things to use, and two of them are so obvious it's painful (input and output) start gambling - pick a construct and see if it fits your problem! You will learn nothing if you do nothing. Just saying. If the question has the word "IF" in it then... use an IF template. Don't worry if you can't think of the rule, just put it in! If the question obviously repeats the same actions over and over, or uses an array, you are 99% likely to need to use a FOR LOOP template. If the question asks you for a Function or Procedure then you're laughing - write out the template for either using a sensible name and try to get the parameters right. Seriously, even if you are just guessing, you can break questions down like this and just write in the right statement and you'll get some of the marks without trying. It's a god send if they ask you to write a function because you'll get marks for simply writing the word function, return and some sensible variable names. If score had a value of 5 then simply the number 5 would be output on the screen. Anything in quotes "like this" is called a 'String Literal' and basically this means whatever you put in quotes WILL be written to the screen exactly as you wrote it. If you intended to output the value of a variable, do NOT put it in quotes or you'll get strange things happening. Actually you won't, it'll just print the variable name on the screen and your users will simply scratch their heads and close your program. Finally, as in the example above, you can put together string literals and variables to make lovely, formatted output that makes more sense than just a number or word being printed to the screen. This technique is called "concatenation" and you'll learn all about it during programming lessons. Use it when: You need to ask the user to enter some information, or you need to get information from another source such as a file. If you don't assign input to a variable... that input will literally be forgotten about. Not exactly useful! The string literal (bit in quotes after the INPUT) is a message that is displayed to the user. It is NOT the input, it isn't what will be stored in the variable - it is what will appear on screen, so should be a nice question. You must complete all IF statements with an END IF - it's really important to show where the IF statement ends! Example 1 shows the simplest use - one rule. If the outcome of the rule is true, then the code prints a message, otherwise it is simply jumped over and ignored. Example 2 shows how to use ELSEIF to have an alternative rule, or how to check a second condition before moving on. This is particularly useful if you have a number of things to check and act upon. Example 3 shows how to use the ELSE statement - ELSE is really useful when you want to have something happen when none of the other IF rules are true. It's kind of a "if it's not anything else, then do this" statement. Use it when: There are not many programs you will ever write where there isn't a need to do things repeatedly. Any time you see repetition in a program, any time you find yourself doing something similar (even with small changes from before) then you need a loop. Key rule - Use a FOR loop when you know EXACTLY the number of times you want to do something. This line sets the loop up. First a variable is created, in this case we called it A. So we can use it as a counter which can be output or used when searching for things. Every time the loop goes round, this line checks to see if A has reached 20, if it has, the loop stops. If it hasn't, the loop goes round again. In this loop we have a variable called rock. The loop will go round and round until the contents of rock is the word "quit"
It's useful to be able to set loops up like this because it means we can make programs that are totally flexible. One time the user may enter 100 things before they type "quit" another time they may type "quit" immediately. Both are totally acceptable and our code can handle this and any other scenario. These lines just show an example of how the loop might work - it also gives the user an opportunity to type "quit" so the loop would end. Note that if the user never types "quit" then the loop never ends! This is simple - we must show where the loop ends. At this point, if the user has not typed in "quit" the program would go back to the start of the loop.
" 'Arry!... 'Arry!... Oi, 'Arry!" 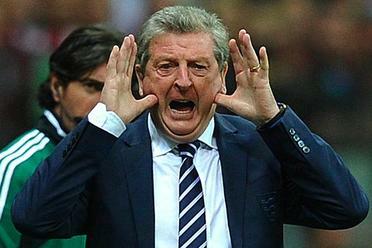 "Roy, it's an Array, not 'Arry..."
More often than not, in programming you want to store a lot of similar data. In most of our examples so far, you've stored a single value - "name" or "age" for example. But in reality, think of any software that you use that only stores one piece of information. The list isn't very long is it? Before we move on, please understand that this is about storing similar data, not identical data. One example may be a list of high scores in a game - the data is similar, but not the same. The same would be true for a list of names - we're storing the same kind of things, but everyone's name will likely be different. that's fine for one name, right? But what about when we add the next person? If we do the same again, remember the rules of variables - the old piece of data is overwritten. Hmmm. This solves one problem, we don't overwrite the previous data, but it does create another problem - how do we know which variable name to use?! How many people will be entered in to the system?! It's all kinds of bad. One step towards a solution here is to use an Array. An array is nothing more than a variable with brackets after it. If you understand a variable, then you understand an array, trust me. Which would create an array (variable) which can now hold FIVE pieces of information. Why five? Because we count from zero, so  there are five spaces in our array. What is the ouput going to be? It's clearly "Trevor"
See, it's not so bad is it? This is clearly a string, right? Notice the quotes. Because you can't multiply text by 35, can you? This now works perfectly because we have cast the string to the integer data type.